This picture was taken a little over a year ago and shows the original accommodation for the tin mining coolies, known as the “Coolie Lines”. Here the coolies would eat and sleep when they were not slaving in the mines or visiting those places of entertainment in the town that provided either female company for a short while (!) or total relaxation “smoking the pipe”. Either way their hard earned-company tokens in which they were paid would be soon spent. The mine itself was just a few metres above them, dug out of the hill upon which, at one time, the Government Rest House stood. But such was the power of the riches of tin, even that had to give way to the inevitable once prospectors found tin in its compound. Clearly a case of MCA, Money Conquers All. The coolie lines were sited, not only close to the mine, but also in the middle of the British officers’ bungalows, on the hill overlooking the town. No doubt that was an unpopular move with the “Mem-saabs” at the time (Mem-saabs or Mem-sahibs was the form of respectful address for a European woman in Colonial times.) who would have felt in danger of their lives with these “natives” living so close by. But now to the point of this post. Gopeng recently hit the world with its new museum and also floated the idea of a heritage town. What a great idea! 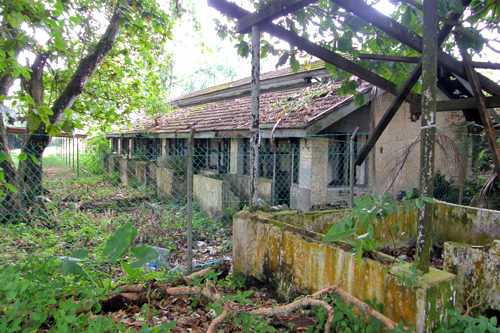 Now, if the coolie lines are still standing (the photo is over a year old) they are large enough to provide space for a tin mining museum or gallery, something the Kinta Valley should have. So come on Gopeng, you have led the way in Perak with your museum, why not show Ipoh and the rest of the state what you can really do by starting our much needed Kinta Tin Mining Heritage Museum.